Wouldn't it be nice to take a break or two during the day, to have a convivial cup of tea with a few friends? Perhaps some homemade snacks to go with it? The Swedish tradition of fika is all about this beautiful ritual. Up until a few weeks ago, all I knew about fika was it involved coffee and snacks. I recently read an article about it in Edible Manhattan written by my tea-friend Rachel. Little did I know how important the tradition was, and how it incorporates dozens of delicious sweet and savory options. Fika is a moment to stop the day and enjoy coffee and snacks with friends. I love the idea behind fika. It's a time to pause, gather. The focus is on flavors, feelings, and emotions. There is so much about fika that can be seen in the art of enjoying tea. I'm amazed at just how many similarities there are. For all of these reasons, fika and tea actually make a natural pairing. 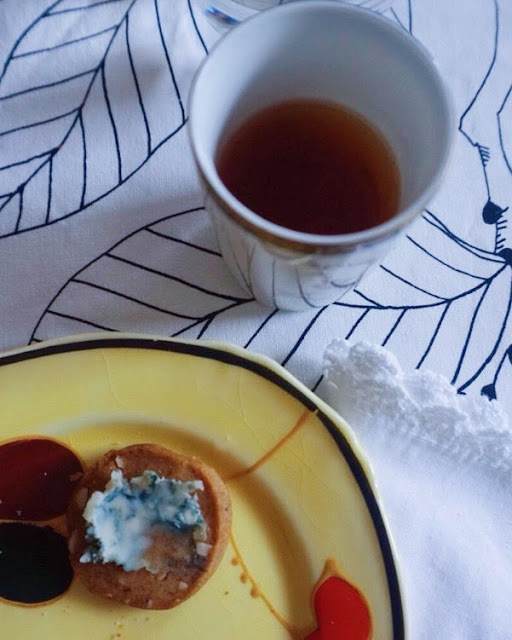 Rachel invited me to a special fika and tea pairing event she organized with illustrator and recipe creator Joanna Kindvall, and Unna Bakery founder Ulrika Pettersson. The event was to promote Joanna's book Fika: The Art of the Swedish Coffee Break. Rachel paired teas with various Unna Bakery sweet and savory fika options. The food was all homemade and delicious. The tea pairings were perfect, my favorite being a Keemun Congfu tea from Joseph Wesley Tea paired with a ginger cracker topped with blue cheese. Yes, this snack sounds like the most bizarre combination. I'd never think to top a sweet ginger cracker with blue cheese! But it actually worked. The salty, funky cheese combined with the sweet gingery cracker was absolutely delicious. The keemun worked like a blanket for the palate- wrapping everything up in a cozy, chocolaty-smooth bundle. The tea calmed the tasty, chaotic ginger and cheese flavors and everything harmonized together. I loved the food so much that I purchased the cookbook. I started reading through it and found a few interesting things to share. Most importantly, in Sweden, "Life without fika is unthinkable." This reminds me of how I feel about tea. I can't get through a day without pausing for at least two different cups of tea. Fika is about maintaining a tradition, which is what tea is all about as well. The book discusses the personal and emotional connection to fika, another subject comparable to tea. 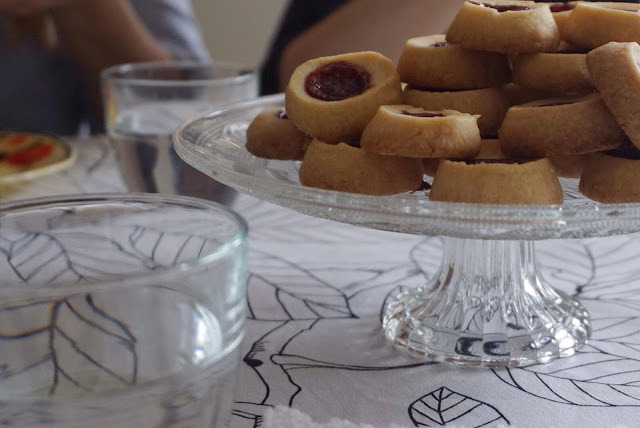 The food and coffee served during fika creates feelings and emotions in the participants. The same can of course be said for enjoying tea alone, or with a group of friends. It struck me that gathering together to enjoy tea and take a few minutes to recharge is something we do through my office tea club. The commitment to making time for a break in the day, to create a special moment to pause the routine. The importance in the presentation is also directly related to the world of tea. For fika, beautiful plates, cups, saucers, and tablecloths should be used. Everything is presented in a beautiful way. This reminded me of creating a beautiful chaxi for tea! Also, the use of quality ingredients, and hand made baked goods has a direct correlation to tea. In Fika, you show respect for the ingredients just as you would find quality tea leaves, and feel reverence for the tea- those that picked and processed it, and where the leaves were grown. Attention is made in preparing the fika, just as mindfulness is used to prepare tea. Now when I make time for tea during the day, I think more deeply about the tradition and emotion behind the simple act of brewing tea and having a light snack. I was quite inspired by the tea and Swedish treat pairings served at the event, and I am excited to try my own combinations. 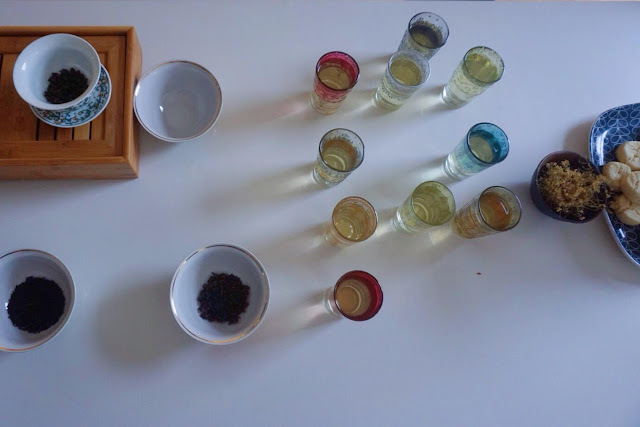 I have a fresh perspective on my love for tea, and how to enjoy it with friends.